I actually had a hard time picking one photo from this set, as opposed to lately when I usually only have one picture that's actually in focus. It was the first gorgeous Spring weekend of the year, so I took the dogs and wife and we had a picnic in a park that I drive by everyday on the way to and from work. There are some gorgeous tulips that were opening up. Tulips are my favorite part of Spring, and you can't help but feel good about life when you come out the other side of a long winter and you get to enjoy 70 degree temperatures and these super vibrant flowers. I started out with my 28mm, but switched to my 50mm which is much better at getting that really narrow depth of focus which compliments flowers very well. I really feel like I'm dialing in my ability to convert the RAW images to something vibrant, sharp and "punchy". Much thanks to Lightroom for being a great tool. I don't want to give Tulips all the love - almost all of the trees were exploding with bright, colorful blossoms. I did see some dafodils but they were a little chewed up by bugs. But for the tulips and these tree blossoms, I don't think I could have picked a better day to be there. I look forward to the summer when we'll have a whole new palette of colors to draw upon. If you want to see all of the photos from this session, check out my Flickr list of photos tagged "flowers". Playing catch-up, yet again, here are weeks 15 and 16. Once again, going to my standy of dog pictures, I was flexing my 28mm lens inside, which I am apt to do when I'm wandering around my PJs on the weekend. I love the sharpness of her eyes and her general expression. Her eyes are dark, and wet, and you can just see her begging. And this shot was taken literally as I had been sitting at my desk for hours working on a side art project one weekend. These sony headphones pump music or podcasts into my ears while I scratch furiously on my Wacom tablet. I'd be devastated if either of those things decided not to work. You get a 3-for-1 special in this post. I've got some catching up to do. First up, a shot from a very empty week. Lacking any inspiration, I went on a walk with Christina and Thor, and out of nowhere this Pit Bull decided he wanted to walk with us. I never know what Thor will do in these situations, I had Christina pick him up while I tried to shoo the dog away. I only managed to get this one shot. It has a lot of issues. The composition is boring, and awkwardly amputates the dogs front legs and rear end off. And it's just a picture of a dog. Nothing special. But in a week of non-inspiration it's the best shot I had that week. Week 13 was a lot better, since Christina and I went to Chicago for my Birthday.I tried to get some architecture shots, but really liked the texture of this building facade, and this is my shot of week 13. This is a building on Michigan Avenue near Millenium Park. There were a few other decent shots from that trip. I was able to bump up my ISO all the way and get a shot of one of the subway tunnels. I like the lines and perspective. And finally near Millenium park, I found this black bird perched on top of a Chicgo sign near Millenium Park. This shot was almost my shot of week 13. And to take it back to basics, I ended up not having a whole lot in week 14. I did spend some time with Thor in the backyard, and I like how this shot turned out. Well, it might not be an exciting shot or even a unique subject. But, it does show off my new lens, my 28mm f/1.8 prime. It is gorgeous, light, and great for indoor shooting! It's a great compliment to my 50mm f/1.4. As you can see it's got super silky bokeh and is really, really sharp even wide open. It fills a nice hole in my lens collection, and I struggled with my decision to even get it. It's a little expensive for something that I technically didn't need, but I found that with my 7d I have been shooting a lot more, especially indoors. My 50mm f/1.4 is fast enough to get some great shots indoors, but it is too tight on my camera, especially since it is a 1.6x crop (a camera like a 5dMkII, for example, is a "full frame" 35 mm sensor), so effectively it's an 80-something mm lens. Too tight for most indoor shooting. I also love shooting wide when I'm outdoors too. I knew I'd get more use out of a wider lens, and when I shoot with my 28-135mm, I typically am below 50mm when I'm shooting outside. I paid attention to all of the photos I've been drawn to when viewing photo blogs and browsing through flickr groups (my primary source of inspiration), and they were on the wider end of the spectrum. While my 28-135mm can get wide enough, it wasn't fast enough for indoor shooting or for that nice silky depth of field that all the kids are crazy about. So, at the end of the day, I justified it as filling that one hole in my collection, and I really feel like I won't need to buy any more glass for a long time. I roll over into double-digits with a strong entry. I love the composition, the post, the motion blur of his fingers, and the halo of light framing Dan's face. I spent this past weekend at PAX East. It is sort of like a cross between a Video Game trade show and a woodstock for gamers. Over 60,000 people descended upon Boston to basically be nerds for the weekend. I like video games, and have been "internet friends" with the members of Metroid Metal, a band that was playing that Friday Night. That first Friday I did not have my camera with me, so I didn't get to shoot their actual live concert. However, the next day there was definitely music happening in the "JamSpace." One of Metroid Metal's guitarists, Dan, was playing a chiptune set (chiptunes are songs created with old sound chips, usually NES or Gameboy), accompanying his own chiptunes with electric guitar. The above portrait of Dan was taken with my 50mm almost all the way open at f/1.8. It represents some skill, but is mostly luck. I was still having a very hard time getting my shutter speed faster than about 1/4 second, so I dialled up my ISO. Looking at the EXIF data for this photo, it was shot at 1/15 of a second at 5000 ISO (I love my 7d for this reason!). 1/15 is way too slow for a handheld shot, especially if it has action. The only thing that saved this shot was incredible luck. I didn't shake my camera while taking the shot, and I caught Dan when his head had zero movement. His body remains frozen while his fangers show the frantic motion that will let you know he was rocking the house. Trust me on the luck part - I have about 70 other shots of Dan that are focused on the wrong thing, full of motion blur, awkward composition, etc., etc. I loved PAX - I got to turn Internet friends into real friends, rock out to some very talented musicians, and when I pulled out my Nintendo DS I didn't feel like a pariah. To check out the rest of my shots from PAX, here is the set on flickr. The above shot was taken in 2008 in Las Cruces, NM. It was an overcast, windy day, with great big gray clouds rolling in over the mountains threatening their wrath. I took bracketed shots all over the place, hoping to do this "HDR" thing I had heard about. I made some weak attempts at in-photoshop HDR at the time, and remember being disappointed. I have learned a thing or two about HDR since then. HDR stands for "High Dynamic Range." It basically refers to an image with way more color and light information than your computer monitor can display. HDR is an attempt to fix a problem that plagues all photography. The photographic sensor is never as good as the human eye/brain. A person can look at the scene above and see the mountains, the sky and the foreground flowers with the same clarity. A camera is not that good and usually you would have to choose what you wanted correctly exposed: the mountain, the clouds or the flowers. With HDR, you can (theoretically) have your cake and eat it too. A lot of times this is done by bracketing in camera and actually taking 3 images at different exposures. Then these images are combined into an HDR image which has way more color information than your monitor can display, and you use software (I used Photomatix) to create an image that (hopefully) has everything correctly exposed. I won't get into technical details, since I'm far from an expert (and maybe I will post a how-to in the future). I created this HDR with one shot (instead of the usual 3 or 5). Since it was RAW, I was able to create my -2, 0 and +2 exposures (exported as JPEGs) off the one image. In Photomatix I played with it until it looked close enough and then exported the Photomatix tone mapped image and the 3 exposures to Photoshop as layers. The sky was a bit neon so I used a layer mask to mask through the HDR layer to tone it down. My original shot had blown highlights in the clouds, so no matter what I did could bring some of the cloud texture back. The key with HDR is realizing that it is not a magic bullet for photography. It is just a way to capture multiple exposure settings in one image. Great for landscapes on a cloudy day, indoor shots with bright windows, or anywhere else where you want to retain details in the shadows and highlights. My photo for week 9 is another indoor shot. I noticed how our dining room lights were catching the flower and filtering through the petals. Next weekend I'll be in Boston for a small video game convention no one has heard of. Of course I'll be taking my camera. I also ordered a new 28mm f/1.8 prime (I'm addicted, what can I say), which should be a great complement to my other lenses and will be wide enough for me to get some good architecture shots in Boston, and should be a fast enough some indoor shots at the event. So look forward to next week's post, where my picture of the week will either be a statue of Paul Revere or some nerd dressed up as a Final Fantasy character. Or both. Wayback Wed - no, wait -Thursday! I'm going back to 2004 for yet another wayback photo. This photo was taken in the summer while 4x4ing in the desert with a friend. I do miss the mountains of the desert, and look at that sky! I don't miss the 120 degree summer days, though. We round out the second month of the year, and the 8th week of my "Photo 52" project. I'm sorry that it's another picture of one of my dogs. Unfortunately, with the weather as it has been (Winter is stubborn around these parts) I didn't get the motivation to go out and shoot. I'm loving the high ISO performance of my 7d, and the above is a shot I couldn't have imagined taking before, lest it be a staticky, noisy mess. And what noise is present in the image (you need to zoom in to see any) is cleaned up in Lightroom. This is a picture I took in 2004 with my first digital camera, my Sony Cybershot 4.1 Megapixel point-and-shoot camera. I was looking at my gigabytes of images, going back to 2004, and wondered why I was letting the bits sit and rot on my computer. Sure, I was learning, and there are dozens of poorly composed and blurry and badly lit shots, but amongst the rubble are some surprising glimmers of hope. I am a student of photography, and I struggle to carve out just enough knowledge to graduate to some arbitrary echelon. I will always be a student of photography, and I hope I never stop learning and improving and finding a unique point of view. Trudging through the stack of old photos in that proverbial digital shoebox-under-the-bed, I found the shot above, which I took of my father-in-law's old Ford pickup back in 2004 (hell, I wasn't even married yet!). I like the composition of the shot, and I can't get enough of that color and texture. I encourage everyone to look back to their old photos, taken on ancient (by today's standards) cameras, and find those diamonds in the rough. They might remind you of more innocent times (before you knew how much some lenses cost!). They might remind you that the equipment you shoot with is no replacement for an agile mind and a keen eye. Or, they might depress you - because, even with your $2000 equpment you can't get shots as good as you could with that old point-and-shoot. Either way, you will learn something about yourself in the process. I definitely plan to plunge the depths and post some more old photos on random wednesdays. The lake behind our house is thawed. Does this mean Winter is over? Spent some time this week learning my new Camera. Who better to pose for me than Cleo? Turns out this was my favorite shot of the week. Week 6, and I found myself going outside again. The daytime temperature is up in the 30s (and 40s if you're optimistic), and this is the time of year anyone will make any excuse to get out of the house! I am no exception, and I have an even better excuse after this year. These shots are from an old abandoned storefront from a Lumber store. I had been sitting on some savings, and eyeballing a new camera body to replace my Rebel XTi. I was also trolling eBay for a used 28-135mm canon lens, since sometimes when I'm outside I need a little more flexibility than a fixed 50mm focal length. Well, I had a little unexpected income and it removed any excuse from pulling the trigger on a new body. I had racked my brain between the 60D and a new 7D. Long story short, I got a new 7D, mostly because it is more of a "shooters" camera, faster focus, more focus points, faster burst, and better remote flash triggering. I know the irony in the fact that all of my shots (except for the one of my dog) have been of things that don't move, so those kinds of features are lost. However, I'm interested in the better low light performance, the 100% field of view in the viewfinder and the magnesium alloy body which should last years and decades. I'm still reading the manual and finding all the bells and whistles and trying to get all the custom settings the way I want them or expected them. I haven't even started calibrating or profiling my lenses, but there will be time! Unfortunately, I am not rich with free time for shooting lately, but I still vow to shoot at least three times a week. (I personally can't wait to not have to worry about a thick blanket of snow everytime I go out to shoot some outdoor shots). The year is almost 1/10th over. Holy cow. I didn't expect this Project 52 to make me realize just how fast the weeks and years of my life are sliding into oblivion. Oh, wait -- what I mean to say, is, I've been a bit busy with work and other commitments, but I swear that this photo was taken during week 5. During the "blizzard" of '11. While stuck at home. I like this because it's something that's hard to do with my camera, and indoor shot with natural light. I have a big set of french doors and a HUGE white reflector (READ: 12 inches of ice and snow) to bounce the sunlight back into the house. I still had to dial up the ISO, even at f/1.4, but Lightroom's noise reduction is quite forgiving. All the lightroom in the world can't get the cliché out of the shot, however. Week 4 of my Project 52 may not have been my most creative week, as shown in this rather cliché shot. Personal projects and work and a bitter winter have made it hard to get motivated to go out and shoot. However, I'm 3 for 3 in actually going out and shooting! We are expected to get 12 inches of snow tomorrow. Now is the time I am grateful for my work's telecommuting policy. We have a stack of firewood in the garage, a basement full of supplies and high speed internet. Bring on the white stuff! Perhaps fitting for a bleakly cold Illinois weekend in January, this post is about death. To the left is a shot from the past weekend's excursion. Contrary to last week's colorful imagery, this set has a much more muted pallette. I took this photo from Mt. Hope Cemetary - this is looking across Kirby/Florida (I think I was in Urbana). While not a particularly stunning or creative shot, I just liked the "feel" of that little side street. And of course, like everything else, it gets more moody when converted to black and white. My goal for this week was to shot a cemetary. On Friday, I brought my camera to work, hoping to repeat my success from Week 2 and shoot at St. Mary's Cemetary, which is, again, just a couple of blocks from work. However, the whole place was fenced in and I couldn't figure out a way to get in without breaking a few laws and invoking the ire of the sleeping dead within. A little bummed out (my week was quickly winding down and I still hadn't shot anything for the week! ), I peered through the ivy-covered chain link fence and spied a splash of color. In a dumpster was a pile of colorful (albeit snow covered) artificial floral arrangements. Leftovers from a funeral or just the result of overzealous groundskeeping, I loved the sad symbolism of these flowers laying forgotten in a dumpster. So, I vowed to return to campus on Saturday and shoot at the much larger (and supposedly more open to the public) Mt. Hope cemetary. About 2:30 or so I drove onto campus and started looking for a good spot to park. Much of the cemetary was fenced in and there were cars parked at the adjacent funeral home -- which had the most obvious access to the grounds. Not wanting to draw attention to me and my camera, I looked for a better spot to park. I did find a parking lot that afforded a gap in the fence where I could enter the cemetary. It might not have been the intended way to get in, but I was sure I wasn't breaking the law and I stayed on the path, so not to incur any bad JuJu. Now, I have shot in Catholic cemetaries in New Mexico that are full of effigies of Christ or the Virgin Mary and lots of kitschy tombstones -- basically a lot of potential for great images. This cemetary was VERY clean and the blanket of undisturbed snow and countless grey tombstones really didn't make for exciting shooting. I tried to find unique compositions and tried hard not to make the subject of each photo to be a person's tombstone. That seemed to be a little too intrusive. Above is a photo I actually had to edit in Photoshop. I masked out the cross and christmas bow and made the rest of the image in black and white. I just loved seeing the burst of color in that pure snow, and wanted to capture it as I felt it. I walked the path for about 30 minutes, and found out my battery was getting low. So, I decided to walk back to the car, fairly satisfied with the couple-dozen shots I was able to get. Then, literarally feet from my car, I spied a little foot path going off the sidewalk and toward what looked like an informal grave marker. It was flanked by two pinwheels dancing in the winter breeze. It was inscribed in Arabic and was so close to the chainlink fence I really wondered it was just a symbolic marker, or if someone was buried there. I was a little heartbroken at what I presume to be a Muslim being an outsider -- shoved to the chain link fence and closer to a dumpster than any other grave -- amongst the hundreds (thousands) of Christian graves at this Cemetary. This was the last shot I got before my battery died, and after some deliberation, it ends up being my shot for Week 3. Above is the Week 2 Photo for my Project 52. There are many, many more from this set available here. Please click through and check them out! I'm 2 for 2 so far this year with my Project 52. This time, the hardest part was choosing which photo out of 94 to make my photo of week 2! My 2nd week ended with me stumbling into some sort of urban/rural graffiti art gallery, and it reminded me of just how important it is to keep your eyes open for great photo-taking opportunities. About a week ago while driving back to work after lunch in Urbana, I drove pasted this big abandonded grain silo (at least that's what I assume it was -- they are common here in Illinois. It didn't look very impressive, but when I picked through the big open doors as I drove past, I noticed the pop of color from some graffiti. Whehter you think it's Urban Folk Art or nothing more than Vandalism, I think Graffiti makes for great photos, because you can capture textures, colors, and a sense of setting with a good graffiti photo. So, I was excited to go out and shoot this place. This place is literally two blocks from where I work, and I didn't want to come during the weekend, so I took my camera to work on Friday to go walk to this place during my lunch break. It was cold, but thankfully not super windy or snowy. It was about 15 degrees, so I bundled up in my scarf and pea coat, grabbed my camera bag, and headed out of my building towards the silo. Trudging through the snow, I was quietly hoping that the trip was going to be worth it. I usually get very self conscious walking with my camera. People do say that if you just take charge with your camera and project confidence, people won't pay you much attention. It's when you seem shy and nervous that people assume you're up to something. While this isn't quite "street photography" I still didn't want to seem like that "weird guy with a camera." When I finally happened on the Silo, I was almost floored by the amount of colorful graffiti lining the walls. It was quite a bit more than I would have hoped since that drive-by spotting. Armed with my 50mm lens, I made sure to check my ISO settings, make sure I wasn't bracketing my exposures, and that I didn't have exposure compensation (basically anything that would ruin my shots), the I set to work trying to find interesting compositions. I was a little nervous that someone would come up to me and kick me out, but nobody bothered me the whole thirty minutes I was there. I ended up taking almost 100 shots. In the excitement I forgot how cold it was, and towards the end my hands started cramping up and going numb. Not wanting to tempt fate, I finally put my camera away, shoved my hands in my pockets and walked back to work, satisfied at a successful shoot. If I learned anything from this, it's that you never know just how close a great shooting opportunity may be. Go for a drive or walk around your neighborhood or your work, and try and discover the hidden treasures that you may not have noticed before. Above is the first photo from my 52-week long (that's one year for those who failed math) photography challenge; my Project 52. A lot of artistic types decide at the beginning of the year to do a "Project 365" or "Project 52" where they commit to working on something once a day or once a week, whether it's writing on their novel, knitting scarves or taking photos. The photo above is of the Mighty Thor, one of my favorite subjects. I can't take all the credit for this shot though. It's all about the light, baby. If you're not familiar with the Golden Hour, it's those times right before dusk and right after dawn, where the sun is low and casts this extremely flattering golden glow on subjects and minimizes harsh shadows. Below are some of the runner-up shots. Some photographers are trying a Project 365 (you know who you are). That's just a little out of reach for me, and I know if I push forward to go shooting 2-3 times a week I know I can find at least one great photo per week, and in my mind having 52 great photos at the end of a year is not bad at all! Besides, if I tried a project 365 I would have already missed days 1-5, and I don't want to start off the year as a failure. For post-processing, I boosted the blacks a tad and added some vignetting, that's it. All the post-processing in the world can't replace being outside at the right time of day. For Christmas I got Lightroom 3, and have been spending the last couple of weeks trying to learn it and develop a sane workflow. Where to keep my RAW files, how to process them, tag them, export them to Flickr and finally post them here on the site. I am going to try and use Flickr as my primary photo host for right now, and serve all the blog images straight from Flickr instead of uploading them to my squarespace account. This saves me a step and really there's no reason to have multiple copies of the same photo on the web. Oh, and sometime this year I'm going to redesign the site. My web design skills may be a bit rusty, but I'm a little tired of the squirrel and dirt motif. My favorite part of Christmas and the Holidays in general is how people seem to start slowing down and taking time to notice each other again. I love receiving cards from the friends and family in my life. But more than that, I love sending Christmas Cards. As a photographer and someone who considers himself artistic, I wouldn't think to just pick up a box of "Generic Card Number 47" from the convenience store. If you are going to be spreading some Seasonal Joy, you need to make it something from you. 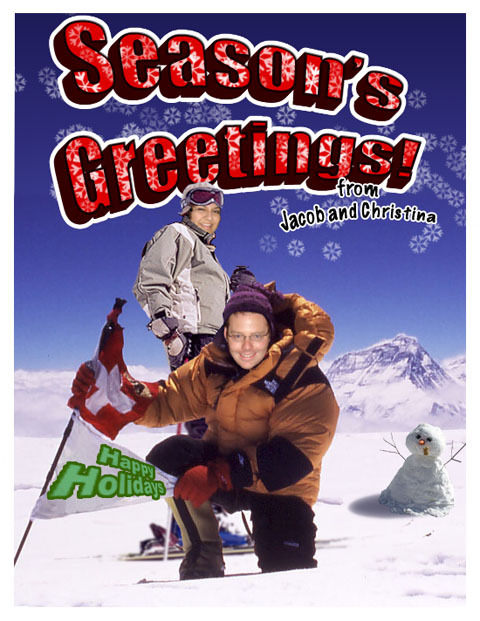 I was excited when my friend Kristin told me she was using Shutterfly for her Holiday Cards. She's a photographer, too, and has very specific tastes and appreciates good, thoughtful design. If you have known me long, you know I love making visual things such as greeting cards. I have made several Christmas cards in years past. Some more extravagant than others. I was excited to use Shutterfly. In years past I would print my own on card stock, which is kind of a pain, and uses a lot of paper and ink. I've also tried other card services and the lack of options or poor quality of the product just left me feeling a little disappointed. Now, I stick to a seasonally appropriate photo and some a warm greeting. It really doesn't matter, as long as it's from you. Go outside and take a picture of a snow covered tree, take it to Shutterfly and call it art. Put on your favorite sweater and pose in front of the tree. Or even, get your Dog into the mix. The point is: go out there, put a little thought into making a personal image, and take it to Shutterfly. They have dozens of great designs, and they'll make even the most mediocre photography into a personal, great-looking Christmas card. I think Next year I'm going to make a personal Calendar for some of those hard to shop for people in my family (*cough*in-laws*cough*). Such a great to way to share memories in a gift that lasts all year long. Or, take it to the next level and order a photo book. We may have ordered a photo book for somebody already. But I don't want to spoil the surprise.